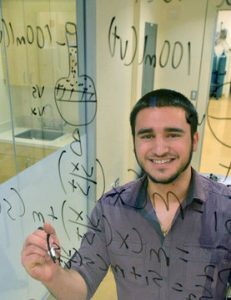 Patrick Fedick graduated from Monmouth in May 2014 with majors in Chemistry with a concentration in Advanced Chemistry, and in Psychology, with minors in Physics and Information Technology. It was not until I transferred to Monmouth University that I found my niche in analytical chemistry in the laboratory of Dr. Tongesayi. As a researcher in his analytical and environmental laboratory, I developed skills in methods development and problem solving, as well as how to think analytically, all of which prepared me to enter graduate school. My opportunities were priceless; being a part of his research group went beyond functioning as a technician and extended to understanding not only the instruments, but also the actual chemistry that was taking place. My research in Dr. Tongesayi’s laboratory was focused and productive; it resulted in one peer-reviewed article and my attendance at two national meetings. It also earned me the American Chemical Society’s Undergraduate Analytical Chemistry Award. My research at Monmouth gave me the credentials to qualify for a Summer Research Experience for Undergraduates (REU) at the University of Massachusetts in 2013, where I worked under Drs. Vachet and Rotello. This experience enabled me to gain proficiency in new advanced techniques in a different research environment. There I worked with Matrix Assisted Laser Desorption Ionization Mass Spectrometry, primarily to monitor nanoparticles in biological systems. This project recently resulted in a publication in the journal Analytical Chemistry. 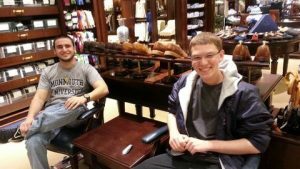 Patrick (pictured above left) with his School of Science protege (now Peer Mentor) Harris Kittner, at Brooks Brothers waiting for a fitting before the Communicate Your Professionalism event in 2012. Since graduate school was always on my mind, I secured campus jobs that would prepare me for the teaching that I would have to do while pursuing my degree. I began laboratory assisting for General Chemistry II and was soon also assisting for General Chemistry I, Environmental Chemistry, Quantitative Analysis, Instrumental Analysis, and Information Technology courses, as well as tutoring and being a Peer Learning Assistant. This past year I was a Supplemental Instructor for Environmental Chemistry and Instrumental Analysis, which meant I sat in on lectures and then held review sessions and office hours. Thanks to my previous research skills and my increased comfort with teaching I was accepted to the doctoral program in analytical chemistry at Purdue University. The most significant job that I held at Monmouth University was being the Peer Mentor Coordinator for the School of Science. Peer mentoring gave me the opportunities to not only extend a helping hand to my fellow School of Science students, but also to improve upon my own professional development. The role of a Peer Mentor encompasses both being a guide through life in Edison and Howard Halls as well as participating in the planning and networking that goes into creating the many great events put on by the School of Science. All of my hard work not only improved my own leadership skills, but also helped others with their professional development. To become a Peer Mentor I had to go through a rigorous application and interview process. In the subsequent two years, as the interviewer, I learned how to conduct myself during an interview. In summer 2014 I am interning with the Federal Bureau of Investigation, assisting agents with their investigations, before I start at Purdue. A major part of why I received the job was because my interview went so well. My interviewing skills, professional wardrobe, resume, and general networking skills can all be attributed to participation in Peer Mentoring Program events. Overall, Monmouth University’s School of Science gave me the education, research experience, and work experience to build a great resume. It then taught me how to craft that resume and how to conduct myself in an interview to set me on the next path after graduation.